Thank you for shopping at Aokdress.com. We Support 7 Days Return Warranty,we're here to help. 1. Receiving the incorrect or defective item . If you receive the incorrect item or defective item due to defects in manufacturing or workmanship , please contact our service center as soon as possible ( must be within 7 days after the goods delivered ) to send photos or videos to our sale service department to show your problem , it will take 3 to 5 days for our sale service department to inspect the photos or videos , if it is our fault , our sale service department will inform you the steps how to apply for full refund or apply for exchange . if customers got designated shipping address for the returning &exchange items ,customer must ship out package within 3 days after you got designated shipping address( must give us relevant tracking number ) , or else , we can not accept any return or exchange. 2. Ordering incorrect size or color .Before you order the products from Aokdress.com , please learn the details of size table , color or other information carefully . As the color , there may be some color difference between the real products and photos . Because there color varies from the products photoed by different light or displayed in different computer displayer .If it is your fault to order incorrect products , you want to return or exchange the products ,customers need to pay for the back freight charge( freight collect is not acceptable) and keep the goods in good condition , contact our customer service center as soon as possible ( within 7 days after goods delivered) to follow our step to returning or exchange the products , when we receive the products and check it in good condition , we will give you refund ( excluding the shipping charge) .if customers got designated shipping address for the returning &exchange items ,customers must ship out package within 3 days after you got designated shipping address( must give us relevant tracking number ) ,or else , we can not accept any return or exchange. 3. Intimates, swimming clothings, lingeries , customized products etc. are the personal clothing , returning or exchange is unacceptable. 4. Before you returning or exchange the products , please contact us service center , so that our customer service will teach you the steps how to apply returning or exchange .if you do not contact our service center before you send the products back ,you can not apply any refund or any exchange . Faulty products can be returned to us if they have the following types of quality defects: stains, zipper malfunction, ripped or torn, poor quality materials, obvious color difference, major difference between the photographed product and the product received. If you experience the above problems, please contact us immediately at our Support center(must be within 7days after goods delivered). Please ship the package to the designated address provided by the aftersales staff. (if customers got designated shipping address, the customers must ship out the packge to designated shipping address within 3 days and must give relevant tracking number) if Aokdress problem ,Aokdress will pay shipping fee for the packge return . If Customers problem , customer have to cover the back and forth shipping fee for the package. We will provide a partial refund as long we receive the return package; to help us, the customer should provide all relevant tracking information. Some items may out of stock or there may be insufficient products to complete the order during the order processing stage. Our customer service staff will contact customers and provide customers with a status update. Customers are eligible to ask for a partial Refund (covering some of the item cost and the shipping fee) in the event of not receiving email notification. To reduce the possibility of disputes, please take clear photographs of the items while placed on the ground and place a ruler or measuring tape to measure out the differently sized part. The photos should then be submitted to the after sales team. Aokdress will reply to your problems as soon as possible. Normally it will take 2-3 business days. Please note the following RMA criteria relating to size differences: Not customized made items: Deviation from the original size by over 3CM.Please ship the package to the designated address provided by the after sales team. Customers have to cover the shipping fee for the package return. 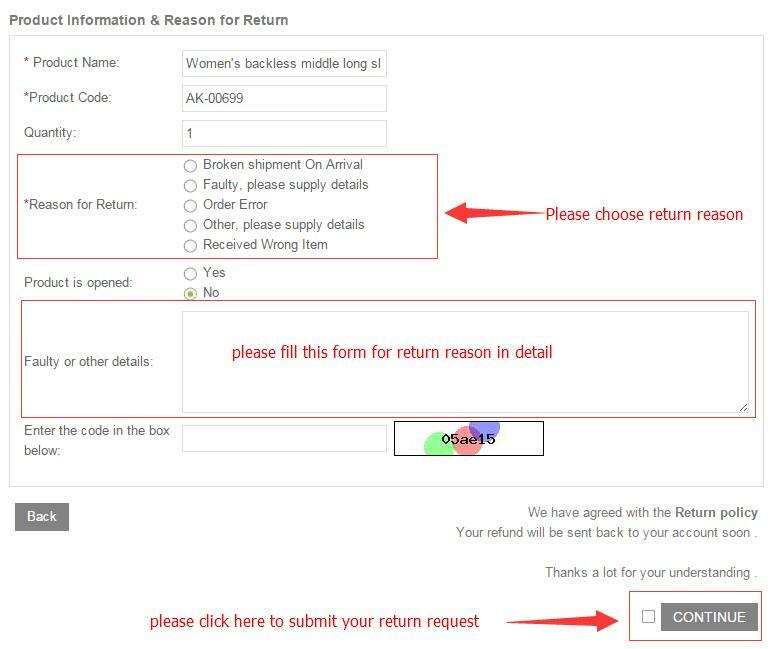 We will provide a partial refund as long we receive the return package; to help us, the customer should provide all relevant tracking information. TIPS:As produts problem which you received ,please contact us within 7 days after you products delivered, if customers got designated shipping address, the customers must ship out the packge to designated shipping address within 3 days and must give relevant tracking number. If our sale service department give ways to solve the customer problem, but customer does not give reply within 3 days, it means that the customer gives up solving the problem . Within the warranty period of the product you purchased, Aokdress.com warrants the products against defects in materials and workmanship. If a defect arises and a valid claim is received by Customer Service within the warranty period, we will ship you a new item or issue a full refund.